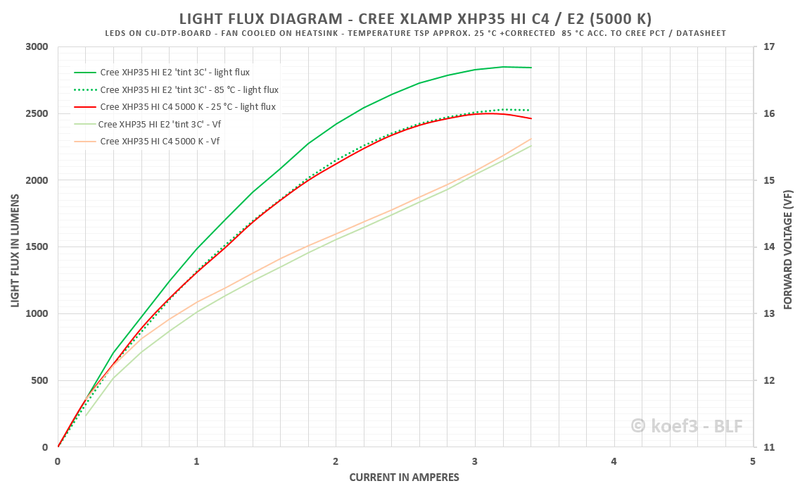 LED test / review - Cree XLamp XHP35 High Intensity C4 + E2 (5000 K) - Really high performance in XP footprint? Since the XHP35 is available on the market, it is often used in high power flashlights. With this LED many flashlight manufacturers got more output at same size and battery configuration. In all the time, I didn’t test this LED though. In this review I test one of the highest bin availabe XHP35 High Intensity (HI) to date, and – as comparison – a slight less efficient XHP35 HI in C4 bin. I got the XHP35 HI with stated E2 binning a few months ago from a TLF member, the C4 one from mouser. 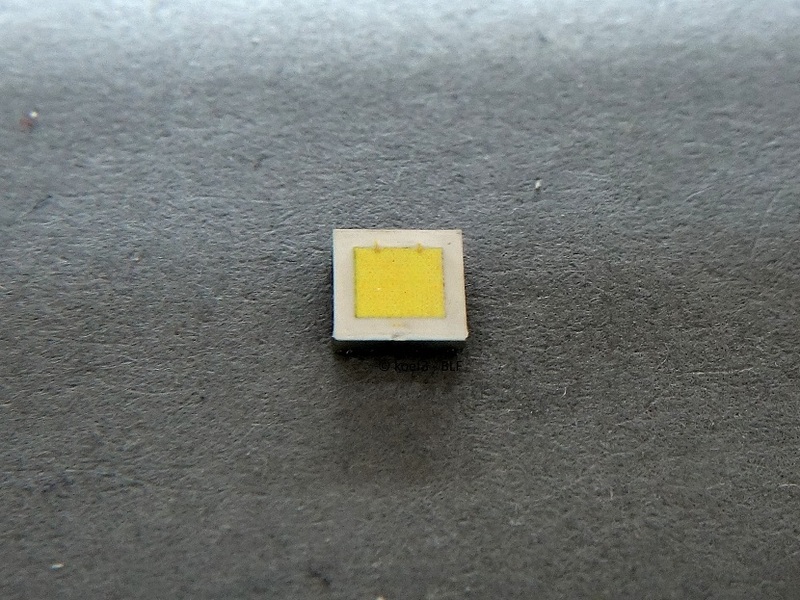 The XHP35 is the smallest LED of the XHP (eXtreme High Power)series. 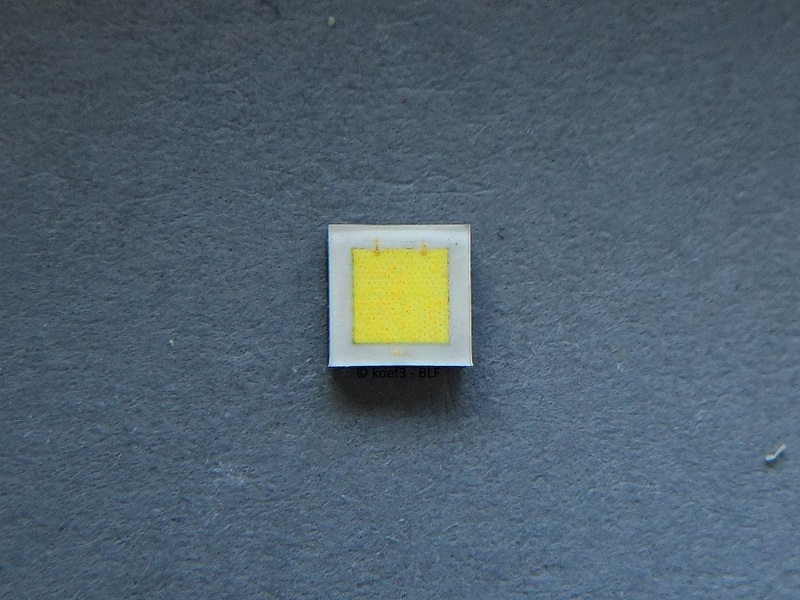 With 3.45 x 3.45 mm the XHP35 HI has the same size like other XP LEDs and also uses the well known standard XP footprint. Two bonding wires are visible, and four single dies can be discerned even without power the emitter up. Two of them are not connected via bonding wires, so the electrical connection lays underneath them (Flip Chip technology). Because of this design the LED runs only on 12 Volts - the dies are connected in 4S (4 in serial). Because the silicon dome is missing, the emitter is very flat. All Cree LEDs without a dome except the new XD16 are labeled as ‚High Intensity‘ (HI). There is also a High Density (HD) version available, which is fitted with a dome. The footprint reveals no surprises, here shown in used condition. Like in unpowered state the four single dies are visible. Unless the other XHP 1st gen LEDs, there is no gap between them. This should improve the beam pattern even in SMO reflectors. 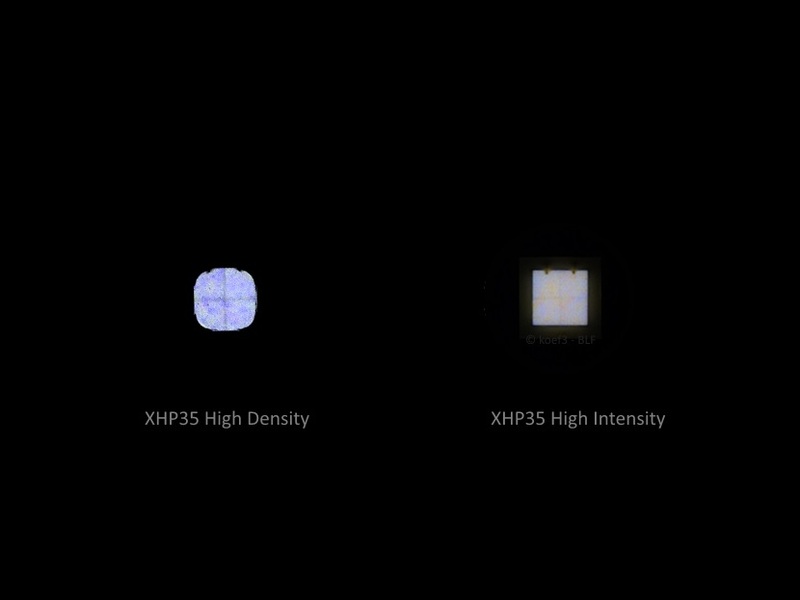 The Light emitting surface (LES) of the XHP35 High Intensity is 5.32 mm² (0.00825 sq in) in size. The XHP35 HI stated as E2 is more efficient than the E2 one, at avg. 12 %. The E2 bin for XHP35 HI is not listed at the Cree PCT. 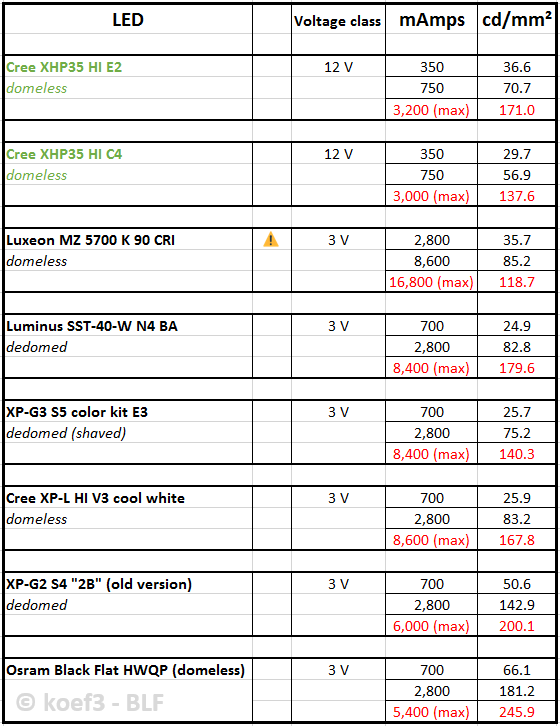 If you would compare the HI E2 with other LED you had to choose the XHP35 HD variant from their list. In overcurrent condition the Vf is very high, about 15 V.
Now a few words to the stated flux bin of this LEDs. The min. light flux for E2 bin is 590 lm @ 350 mA 85 °C Tj. See also Cree PCT for this. The XHP35 HI E2 tested here delivers 562.2 lm where the C4 delivers 495.6 lm. Conclusion: the first LED does not reach it’s minimum light flux for bin E2, the C4 binned LED on the other hand is slightly better than stated in datasheet (min. 475 lm @ 350 mA 85°C Tj). So the alleged E2 flux bin is in fact equivalent to D4 bin (min. 550 lm) – the highest XHP35 HI bin which Cree list in his official documents. Against my experiences, the spread in efficiency is obviously very big. A XHP35 HI E2 I tested much earlier but with the same test setup reaches almost 3,000 Lumens and therefore complies with the stated bin. The apparently existing of such high bins of Cree emitters makes me suspicious (pictures of Cree reels with XHP35 HI E2 printed circulates even in the BLF). Not only in case of this LEDs such high light flux bins are not listed in official datasheets and the Cree PCT. But why Cree makes such a secret out of LED binnings, and why Cree doesn’t sell this LEDs officially (like at Mouser or something)? I have a possible theory about this. Maybe the stated highest flux bins are not really binnings, but ‚golden samples‘ which are detected and sorted out at production while sorting each emitter in bin and color kit. Unfortunately the amount of these super-efficient emitters could be much too low – and if such LEDs are offered at the market officially the availability simply could not be guaranteed. This could maybe explain why some of the tested XHP35 HI E2 have a unusually large spread in efficiency. Maybe some of you members have a better theory about this? The maybe existing spread in the bins and max. light flux could be very interesting for our thrower and ‚maximum possible performance‘ fans. Important: due to destroying of the emitter used in the light flux I had to use another XHP35 HI E2, which might be more efficient than other samples (see also 'interesting facts' section above). Selecting of very good samples might be necessary for highest-performance mod projects. With 171 cd/mm² the luminance of the XHP35 HI in E2 binning is very high. It is as high as of the XP-L HI V3 and comes close to the dedomed SST-40-W! At approx 35 percent bigger LES as of XP-L HI V3 the light flux of the XHP35 HI E2 used for luminance test is also approx 35 percent higher, so the values are plausible. The C4 one performs much lower, but comes still close the dedomed XP-G3 in highest bin. At this point I don’t need to explain further. The XHP35 HI is often used in modern flashlights and their beamshots are published everywhere on the net. Because of the missing gaps between the single dies there is no big ‚black hole‘ in the center of the spot. At some flashlights there might be some yellow or red areas in the spot (see beamshot) or little dark points, but much better than the weird beam patterns of the bigger XHP50 and 70. In the luminance test with a Convoy C8 SMO reflector there were no darker spots or miscolored areas in the beam. To mix the light and get a really nice and uniform color distribution I recommend the use of an OP reflector and/or diffuser film. A good LED, like everyone know. Relatively nice beam pattern, also a acceptable performance and good handling makes it to a good choice for modding lights. But – there is one big con: the XHP35 HI needs 12 V and also special electronics. Because of this the XHP35 is not suitable for all flashlights despite the same XP footprint. The flux bin E2 is not reached in this test, it rather corresponds to D4. I hope you enjoyed this test - and thanks for reading! Thanks for all the work again, this will be a good reference for building lights with the XHP35! The question is why is Cree hiding the highest bins in their documentation? And another question: why is Cree not selling them to authorized Cree resellers, like Mouser? I don’t think that this is made out of no reason. 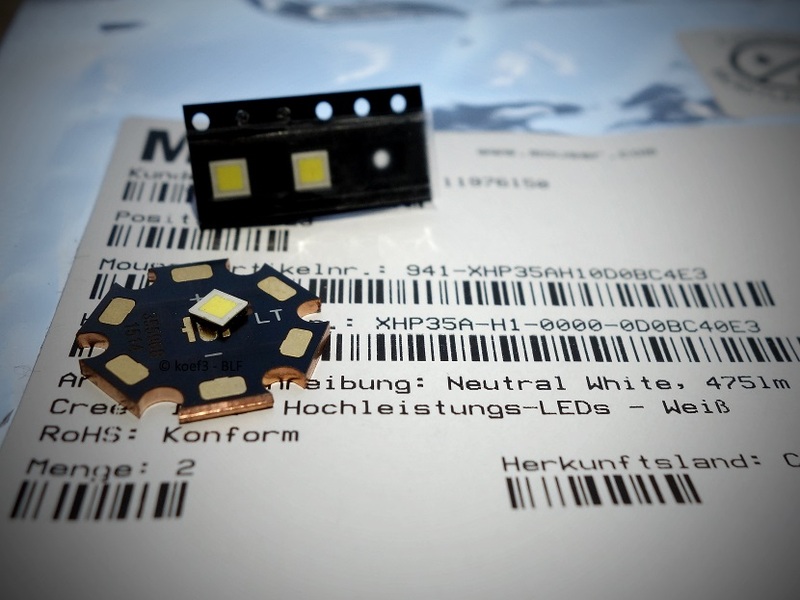 Earlier the same things happened with other LEDs, like XP-L or XP-G2 (in the meanwhile the bin S4 / S5 are officially documented). Possibly because Cree was not expecting to produce their highest quality in big enough amounts. Mouser is buying thousands of LEDs in one order and usually they do not stock all tints (or even different bins). If Cree can only deliver a few hundred of one bin Mouser may not be interested to list such a ‘special’ item. If the yield is constant the new bin will show up in the next revision of the datasheet. One question: how do you calculate your sweet spot? Currently I does not calculate anything for the sweet spot, in general I call the point ‘sweet spot’ which is roughly 15 – 35 percent under the possible maximum light flux because such a difference is not really visible with the eyes. Could be a thing for my upcoming tests to always get the same calculation. 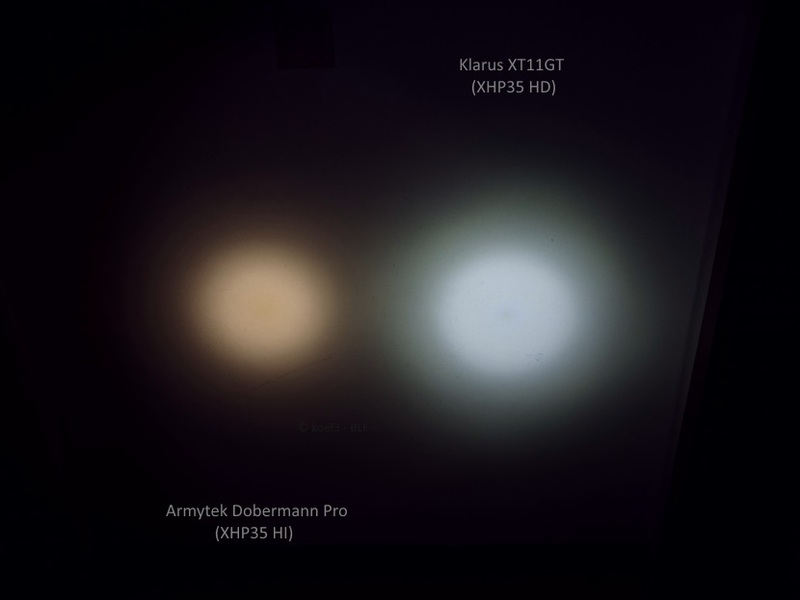 Luminance of XHP35 HI E2 added in OP. 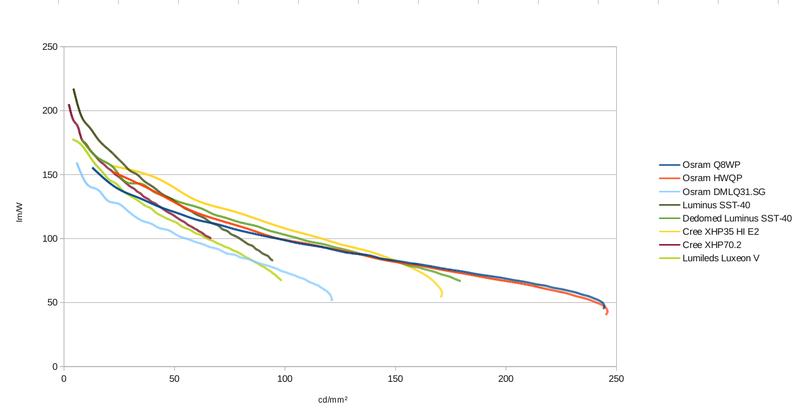 I updated the luminance values for all LEDs shown in test chart including XHP35 HI C4 / E2. I used another E2 sample for luminance testing due to destroying the sample used for first light flux / luminance test. Koef3, so you were getting 2850 lumen at 25°C temps? Did you do short pulses to measure this? If you were to measure the temps after 30 seconds, where do think it would drop to? Would it hit 85°C temps in 30 seconds? My cooling rig is very big and the thermal resistance of it is very, very low especially since I optimized the whole cooling for lowest thermal resistance. So I got almost no drop in light flux due to higher Tj / Tsp. After 30 seconds the light flux at highest current possible hasn't changed in a significant way (+- 0.5 percent maybe). This means also I have not to measure the light flux in short 'pulses'. However, in flashlights (especially these with less massive material in the head) it is almost impossible to get these really good values from my lab testing conditions. But this depends really on flashlight type and board used. Are we at the point where we can have 2700 Lumen out the front flashlights from the factory? No, not really. From my experience flashlights have never the same low thermal resistance from LED to case so the highest current possible is lower than in my tests. I have just recognized that my Nitecore MH23 with an XHP35 HD shows a little less brighter spot or dark area right in the center of the big white spot. It can only be seen when doing a whitewall shot but it’s definitely visible. I checked the flashlight’s LED but all four die areas seem to work fine. The dark area only disappears when being closer than 1,5m to the wall. Any distance beyond 1,5m will reveal that there is a minor dark spot within the spot. According to the first post of koef3 I assume this is absolutely normal, isn’t it? Unfortunately I cannot post any pictures of the whitewall shot as the camera sensor will immediately equalize the light intensity to the aperture. That can also be from the reflector not being at the perfect distance from the die. Thank you Enderman & Lexel! Is there anything I can do about it or would you recommend to accept this “as is”? I must admit I have not recognized it when using the MH23 outside. Can this dislocation between emitter and reflector happen when the flashlight suffers small shocks from falling (during transportation) or is that very unlike to happen? I’m talking about veeeery small shocks, so 4-6cm of drop height. The only way to fix it would be to open the head, which I’ve heard is pretty hard on most flashlights from nitecore. If you don’t notice it much during use, don’t bother. The reflectors are very solid inside the light, and the thing that would cause a donut hole is a Z axis translation, so no it almost certainly isn’t from any drops. Alright, thanks a lot! So, I don’t need to be worried about it. The dark spot can only be seen if you really look for it on the ceiling or wall. My MH23 only “dropped” 4-5cm from a bag into a plastic box while inside its holster. So, I guess this does not even count as a real drop. I’ve been asking myself a question: what makes efficient thrower LED? High cd/mm² together with high cd/mm²W? In a way that’s a good metric. If you want a lot of throw in a thermally limited host, that’s what you need. But a smaller emitter always wins. When your thermal limits are more relaxed that may not be so good…. I wanted to abstract away LED size. What is “efficient LED”? Here I say it’s one with high efficacy. What is a “thrower LED”? One with high surface luminosity. What I call efficient thrower LED? One that can achieve high surface luminosity without becoming inefficient. It seems size abstraction works like expected – compare Blackie HWQP with Ostar Q8WP – their behaviour at high intensity is about the same. XHP35 HI really looks very nice here as well….until it reaches (probably thermal) limits. Looks like if someone reinforced SST-40 bond wires it could go for longer. Note that alone this chart says nothing about “what LED should I use in host X”. Size is a critical factor here and I explicitly ignore it. But I think it’s an interesting secondary metric. Domed emitters are more efficient than flat ones? It’s not strictly false, but from now on I will call it a misconception – because that’s not so simple and often straight incorrect. If you take a LED in domed and dedomed variant, the former is more efficient, regardless if it was domeless from factory or dedomed later. 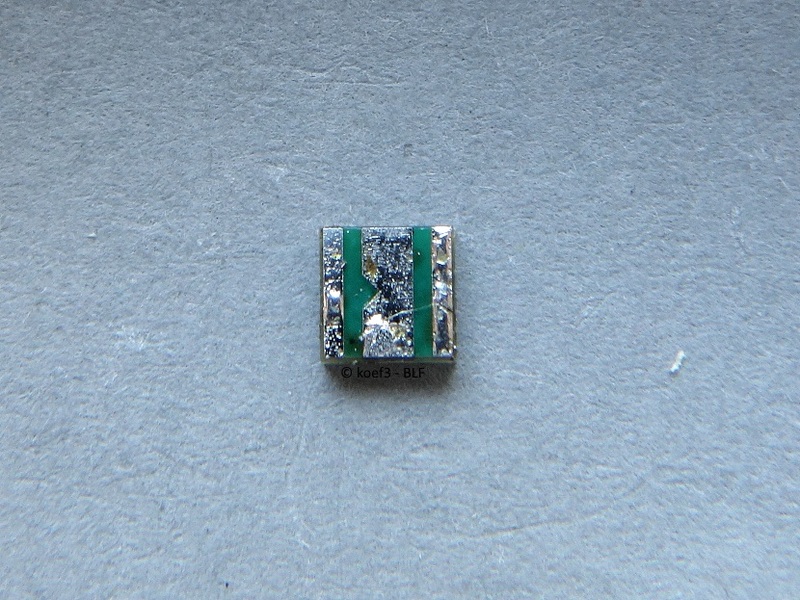 But unless you want to have your LEDs severely underdriven, a flat LED with larger die will offer same throwiness (i.e. cd/lm) with better efficacy. Obviously there are often market related reasons why a domed emitter might be preferred. F.e. there is no larger one in the footprint and price point that you’re targetting. But in general I think that (outside of lanterns and other lights targetting extreme efficiency) flat LEDs are just better. And thank you koef3 for enabling me to draw these charts as well as these conclusion. Your intensity measurements are what makes your tests special. Very interesting. The XHP35 HI reaches thermal limit, indeed. Tj is reached very quickly, because the Vf is very very high (3,400 mA with 2,843 lm at 15,52 V!) which lowers the efficiency significantly. 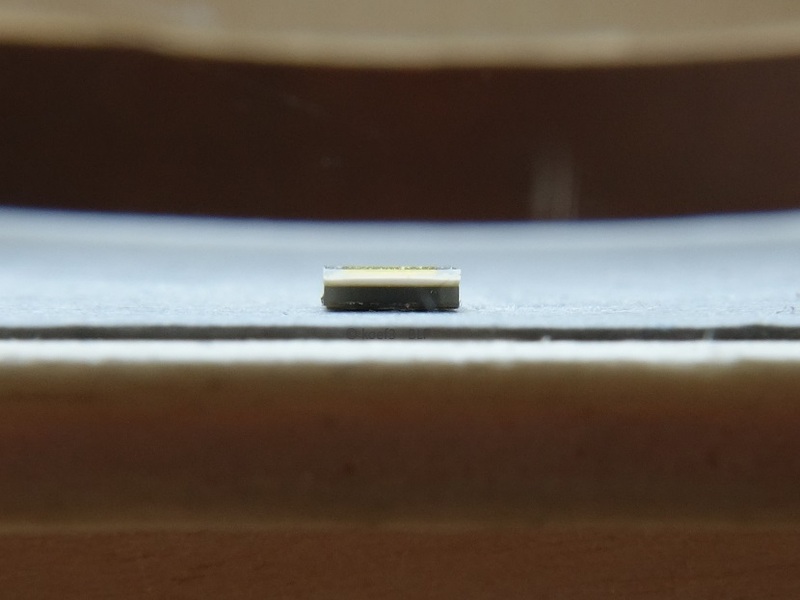 The small thermal pad of the XP footprint is likely to negatively impact heat dissipation. I added more LEDs to the chart above as well as a few more words.